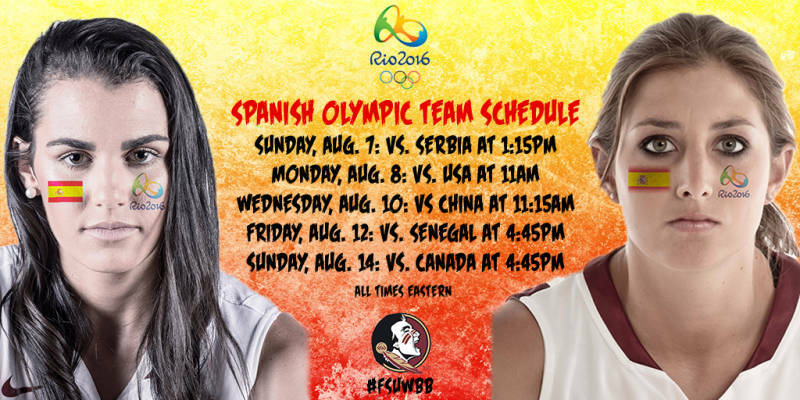 TALLAHASSEE, Fla. (Seminoles.com) – The Florida State Women’s Basketball program will have two representatives in Rio this summer– Leticia Romero and Leonor Rodriguez have officially been named to the Spanish Olympic Team. The two Garnet and Gold standouts, one current and one former, will be the first members of Florida State Women’s Basketball to compete in the Summer Olympic Games. Spain, which is currently ranked third in the FIBA World Ranking, will compete in Group B which includes the United States (1), China (8), Canada (9), Serbia (14) and Senegal (24). Romero and Rodriguez make their Olympic Games debut on Sunday, Aug. 7, at 1:15 p.m. ET against Serbia. Spain then faces the United States on Monday, Aug. 8, at 11 a.m., followed by China (Wednesday at 11:15 a.m.), Senegal (Friday, Aug. 12, at 4:45 p.m.) and Canada (Sunday, Aug. 14, at 4:45 p.m.). Once the group phase is completed, the quarterfinals begin on Aug. 16, followed by the semifinals on Aug. 18. The gold-medal game takes place on Sunday, Aug. 20, at 2:30 p.m. ET. Both players contributed to Spain’s qualification at this summer’s FIBA Qualifying Tournament in France. Spain defeated China (77-43), Venezuela (83-55) and Korea (70-50) to earn a spot in Rio. Against Venezuela, Rodriguez led the Spaniards with a game-high 24 points on 10-of-13 shooting. Spain will make its fourth Summer Olympics appearance, including its first since the 2008 Games in Beijing. The country is searching for its first medal on the World’s Biggest Stage after finishing fifth in Barcelona in 1992, sixth in Athens in 2004 and fifth in Beijing. Romero still has one year of eligibility left as a rising senior. The Las Palmas, Spain, native has guided FSU to an NCAA Elite Eight berth in 2015 and another Sweet 16 trip in 2016. In her two-year career she is averaging 11.3 points, 4.7 rebounds and 4.9 assists while shooting 47.8 percent (229-of-479) overall and 44.8 percent (56-of-125) from long distance. Rodriguez also hails from Las Palmas and developed her game tremendously at FSU. As a senior she led a balanced Seminole squad with 14.9 points while shooting 45.1 percent from the floor and 35.4 percent from 3-point range. She earned All-ACC First Team honors that season. Semrau and Associate Head Coach Lance White will both be in attendance to support their players at the Summer Olympic Games.